Your American Eagle Ultima Water System features 2 tanks, one with catalyic carbon for chloramines & chlorine, and chemical reduction. One tank for simply softening and polishing. 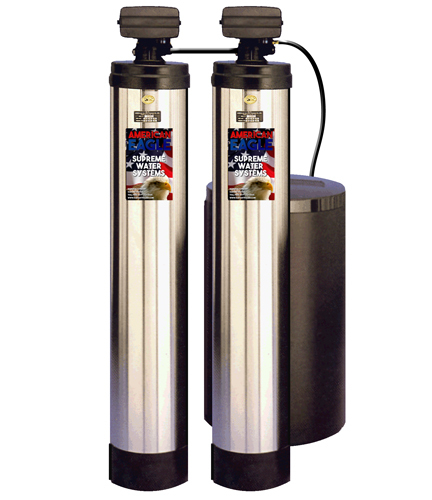 The Ultima offers the same advantages as our Supreme Series but with enhanced capacities for reduction of chlorine, chemicals, organics, pesticides, and chloramines. Also available with KDF 55. Many types of custom valves and media is available. Best prevention available! This product is custom fit to your home! • Twin polished stainless steel outer tank encases a fiberglass filament center tank, which surrounds a heavy plastic blow-molded inner tank. Also available in Black & Almond.